The CARICOM Free Movement is an agreement amongst the Caribbean Community and Common Market (CARICOM) member countries. They created a Caribbean Single Market and Economy (CSME) allowing the free movement of people, goods and services in the region. This agreement makes it easier for citizens of one member state to locate jobs in the Caribbean in another member’s state. 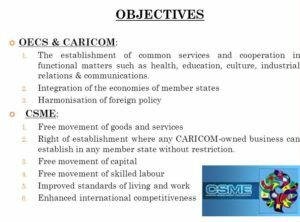 What is CSME (CARICOM Single Market Economy)? How does CSME Benefit Me? What is the CARICOM Free Movement Clause? What is a CARICOM Skills Certificate? Who can get a CARICOM Skills Certificate? I’ve Got my CARICOM Skills Certificate, now what? CARICOM is an organization of the Caribbean Community Market where 15 nations work together promoting cooperation and economic integration since 1973. Its major function involves coordination of economic policies for a regional single market. In addition, it helps their lesser developed countries. CARICOM also settles regional trade disputes. Its headquarters is located in Georgetown, Guyana. CARICOM was established by the Treaty of Chaguaramas of the Caribbean Community in 1973. The original treaty can be read here. From 1973 to 2001, it was called the Caribbean Community and Commons Market which replaced the former Caribbean Free Trade Association (CARIFTA) created in 1958. Membership in the CARICOM is open to all states or territories in the Caribbean Region. CARICOM consists of twenty Caribbean countries where 15 are full members and five are associate members. Since the 1973 Treaty of Chaguaramas, CARICOM promotes economic growth and cooperation amongst its member states. 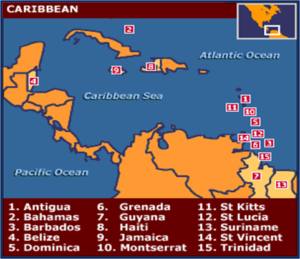 This includes the creation of the Organization of East Caribbean States (OECS) in 1981. The OECS is an inter-governmental organization assisting member jurisdictions with good governance, protecting their legal and human rights, along with providing economic relief in the event of natural disasters like hurricanes. In addition, the treaty created the Caribbean Development Bank which provides funding so members can develop their natural resources. 4. 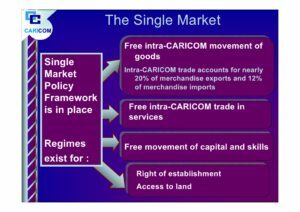 What is CSME (CARICOM Single Market Economy)? The Ministry of Foreign and CARICOM Affairs describes the CARICOM Free Movement as an agreement by most of the CARICOM members which created a single economic market structure. In 2001, the heads of government of most of the member states revised the Treaty of Chaguaramas. They established the Caribbean Community and the CARICOM Single Market and Economy (CSME), which harmonized economic policy and created a system leading towards a single currency. In 2005, CARICOM created the Caribbean Court of Justice (CCJ) replacing the Judicial Committee of the Privy Council located in London. CCJ is the final court of appeal for CARICOM members and also hears and decides regional trade disputes. The CCJ ensures observance of the law while interpreting and applying the principals of the revised Treaty of Chaguaramas. In 2006, the CSME removed restrictions for goods, services, trade, and several categories of labor so they could be freely moved between member states except for The Bahamas and Haiti. The CARICOM Single Market and Economy (CSME) benefits everyone in the region by providing more opportunities to produce and sell goods and services while attracting increased investments. Free Movement of Capital (abolishing foreign exchange controls and allowing currency conversions leading to a common currency). These five systems provide improved standards of living and work opportunities for a sustained economic development for the entire region. 5. How does CSME Benefit Me? If you are a citizen in one of the CSME member countries, you can work in any other member’s country without applying for a work permit. Companies which produce goods can tap into natural resources of other member countries. In addition, member countries may be able to access capital available to all members. According to the BBC, there are “Many benefits from the CSME”. Since 2005, the CSME brought together the region’s resources to produce better quality products and services for local consumption and exports outside of the region to bring in hard currency for economic development. The various member Caribbean islands along with mainland Guyana and Suriname are being united and fortified by the strength of a single market economy. In 2015, The Grenada Informer newspaper declared “The Benefits of CSME are there for the Taking”. Comparing the CSME with similar ones in Southeast Asia (10 SE Asia countries) and the Pacific Alliance (Four Latin American Pacific Coast countries) along with the 28 members of the European Union (EU); the Caribbean countries will become stronger with an alliance with its neighbors. 6. What is the CARICOM Free Movement Clause? 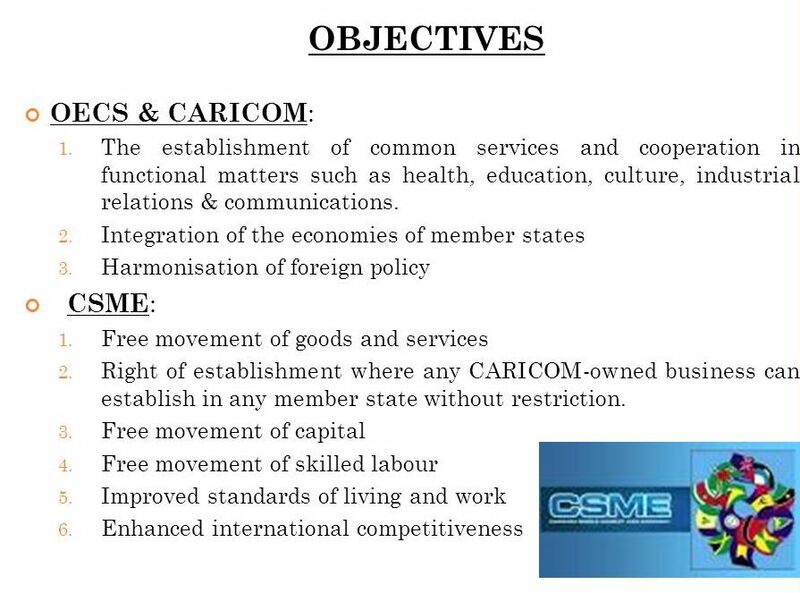 The CARICOM Free Movement Clause is the heart of the CSME. The original initiative allowing for free movement of skilled workers began with the 1989 Grande Anse Declaration which has been modified over the years. The Free Movement of Skills clause enables members to seek employment in any other member’s state without the need for immigration visas or work permits. Their families can also relocate without having to apply for immigration residency visas. The Treaty of Chaguaramas in Article 45 states that the member states are committed to the free movement of their citizens within the CARICOM community. In addition, graduates of colleges and universities with at least a Bachelor’s degree are specifically allowed free movement of their skills to other members’ countries. This right also includes workers in the following fields: artists, musicians, media, and sports persons. This has also been extended to include service providers along with managers and supervisors. This is known as the “Movement of People” mechanism. The Freedom of Movement clause also extends to the right to access real properties for business and residential purposes. In addition, the freedom of movement allows the right to freely leave and return to any member state. This is known as the “hassle free” travel allowing member states citizens the right to cross national borders with just a travel permit or an Inter-Caribbean Travel Document (I.C.T.D.). Every entry point maintains a special “CARICOM Residents” line for faster entry. The Freedom of Investors allows for the movement of persons and physical resources to the points of production located in other member states. There are no import duties or tariffs and quantitative restrictions on CARICOM origin goods. Business people can move capital and investments via checks, bank notes, and electronic transfers. The beginnings of a viable regional Stock Exchange has started by cross-listing of companies. This allows companies to gain region wide access to capital markets at competitive rates to establish more competitive production sectors which will benefit consumers. Instead of just producing for smaller states of 10,000 people, production can increase to accommodate the region’s 14 million people. According to the CARICOM Secretariat, this will increase intra-regional trade. 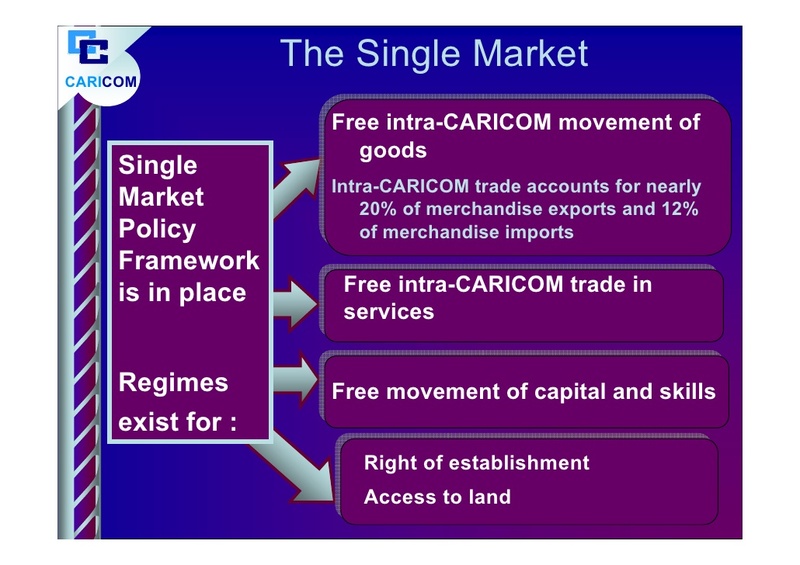 In essence, the CARICOM Single Market and Economy’s Free Movement creates a Caribbean Region without barriers along with the collection of all resources and opportunities for the economic development according to the CARICOM organization. This facilitates the free movement of goods, services, capital, and people amongst the member states. 7. What is a CARICOM Skills Certificate? The CARICOM Skills Certificate qualifies and certifies skilled workers allowing them the freedom of movement to work in any other CARICOM member state. According to Jamaica’s Ministry of Labour and Social Security, CARICOM enacted the Free Movement Skilled Persons Act in 1997. The Act facilitates the free movement of skilled workers amongst all member states in the region. Qualified Caribbean Community Skilled Persons must obtain a “Certificate of Recognition of Caribbean Skilled Person”. Every CARICOM member state issues this required certificate to qualified skilled persons. 8. Who can get a CARICOM Skills Certificate? Citizens of every CARICOM member state who are graduates of qualified universities with at least a Bachelor’s degree qualify for the Certificate of Recognition. In addition, this certificate may be issued to employees working in the industries of: media, sports, musicians and artists. Service providers also qualify along with supervisors and managers and technical staff of various industries. Citizens graduating from other universities may apply for recognition of qualification based upon an assessment from a member state’s University Council or its equivalent. Examples include the Barbados Accreditation Council (BAC) and the University Council of Jamaica (UCJ). Vocational training as a qualification requires a Caribbean Vocational Qualification (CVQ) Certificate or its equivalent. To be qualified as possessing a Skill requires certification and assessment of qualification from a member state’s University Council or its equivalent. According to the Jamaica Information Service in 2014, “More Job Opportunities for CARICOM Nationals” are available. This includes domestic workers such as “trained household helpers”. Jamaica now includes five new categories for CARICOM workers including: artisans with a Caribbean vocational qualification, teachers, nurses, and those earning associate degrees (instead of a Bachelor’s degree). In addition, Jamaica now allows metal and machinery workers, construction workers, electrical workers, plant and machinery operators, and food processors. These workers are still required to have a CARICOM Certificate of Recognition of Skills Qualification for these types of work. Jobs in Jamaica are made easier to obtain by all skilled CARICOM citizens. That’s because Jamaica took the initiative to broaden the skills required to seek jobs in Jamaica. Complete an official application form obtained from the Ministry of Labour from a member state. File a certified copy of a College or University Degree, a Diploma, or an Associate Degree. In addition, applicants must provide a letter in a sealed envelope from the institution which awarded the degree, diploma, or certification verifying that the applicant’s qualifications are authentic. This must be an original formal letter written on the institution’s letterhead signed by an authorized official. Transcripts will not be acceptable. Provide a certified copy of applicant’s passport page showing personal information and expiration date. Provide a certified copy of applicant’s birth certificate. If applicant’s name differs from the birth certificate, provide documents supporting name change such as a deed poll. Three (3) passport sixe photographs of applicant’s entire face. Recent police report from country of residence for the past three years. If the dependent’s name differs from his/her birth certificate (or the applicant is not named as a parent), provide a declaration signed in front of a notary public or justice of the peace from two persons knowing of the birth and that the applicant is the parent. Certified adoption documents if the dependent was adopted. Certified copy of a Marriage Certificate for applicant’s spouse. If either the applicant or dependent spouse was previously divorced, provide a certified copy of the Decree Absolute signed by a notary public or justice of the peace. Provide a certified copy of a death certificate if a former spouse is deceased. Click here to download the CSME Application Form which is in PDF software format. 11. I’ve Got my CARICOM Skills Certificate, now what? Once you receive your Skills Certificate you are ready to search for Caribbean jobs in the CARICOM region. This includes jobs in Jamaica, jobs in Trinidad, jobs in Barbados, jobs in Dominica, and all of the other CARICOM CSME member states. We at IslandJobs make it easy for you to search for different types of jobs, industries, and specific islands and countries. And, it’s totally Free. We won’t charge you for creating an account, uploading your resume, completing your profile, communicating with employers, or accepting a job. IslandJobs is headquartered in the Caribbean and serves the needs of local companies and business owners seeking qualified employees. Don’t waste your time reading Caribbean newspapers classifieds or traveling to the islands looking for work. Just Register for Free to see the many job opportunities in the Caribbean and Central America our online platform offers. CARICOM employers and recruiters already joined IslandJobs in order to post job openings. No need to deal with intermediaries or online job sites acting as recruiting agents. You get to post your resume and profile for Free. Employers posting job listings can view job seekers’ resumes & profiles and contact them directly for more information or an interview. Recruiters purchase a subscription so they can search for employment candidates, read their resumes and profiles, and contact them directly. It’s that easy! We are here to answer any questions and help you to locate and find the ideal job opportunity. Take a look at our FAQ’s page which will answer most of your questions. If you still have questions, Contact Us for Free. We are here to help you at No Cost. So whether you are seeking jobs in Jamaica or jobs in Trinidad; rest assured that IslandJobs provides you with job opportunities in those two member states. We also list jobs in Barbados and jobs in Dominica and the rest of the member states. Sign Up now for Free. Searching for Caribbean jobs can’t get any easier. Steven Rich, MBA – Steven is a freelance writer with experience in Real Estate, International Law, Marketing, and Journalism. He is a Google Top 10 writer, with many of his articles ranking in the #1 spot for their main keywords.